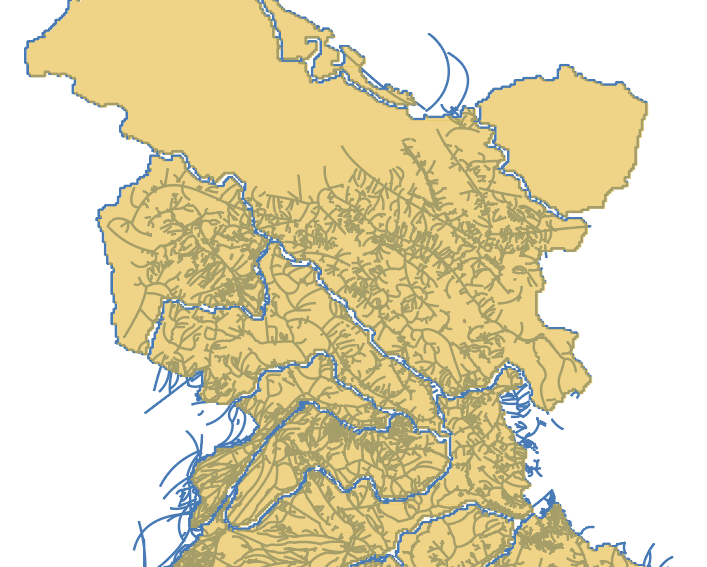 I have two layers - one layer that is a map of rivers (the lines), and a second layer that is a map of the catchment basins (the polygons in yellow). I intend to make a colourful map where the rivers have different colors based on which catchment they are in. I would like to convert all the river paths into groups of paths that are split by the shape of the catchment polygons. And then stylize the group paths accordingly. I converted the polygons into a complex path, the rivers into a complex path and then tried clipping it, that didn't work. How else can I do this in Illustrator? Pathfinder Panel: Click the Merge button. You will then have individual sections based upon areas of adjacent color. Note that this will split the "ochre" colored masses by the river paths as well. If you want those encompassing shapes to remain whole shapes, then duplicate those first and do not include the duplicates when using Pathfinder. Then you'll have to delete the divisions created after running the Pathfinder command. For more on how the Pathfinder operations work, see here. Not the answer you're looking for? Browse other questions tagged adobe-illustrator clipping-mask or ask your own question. In illustrator how do I create a clipping mask path based on a path layer? How did I create this double path (Illustrator)? How to replace a layer full of objects with another layer (in its exacted place) in Illustrator? How, in Illustrator, do I release a clipping mask without releasing masks contained by that group? How do I make an object fill transparent without showing background objects in Illustrator?